Ready for a blast from the past to completely blow your mind? While most people today take it for granted that a Magic 8 Ball fits easily in the palm of their hand, there’s an older generation that remembers when that wasn’t the case. Can’t imagine it? Well, luckily there’s photographic evidence. This incredible picture from 1959 shows what it was like when Magic 8 Balls were so big that they took up an entire room! Isn’t that wild? Magic 8 Ball technology has really come a long way! 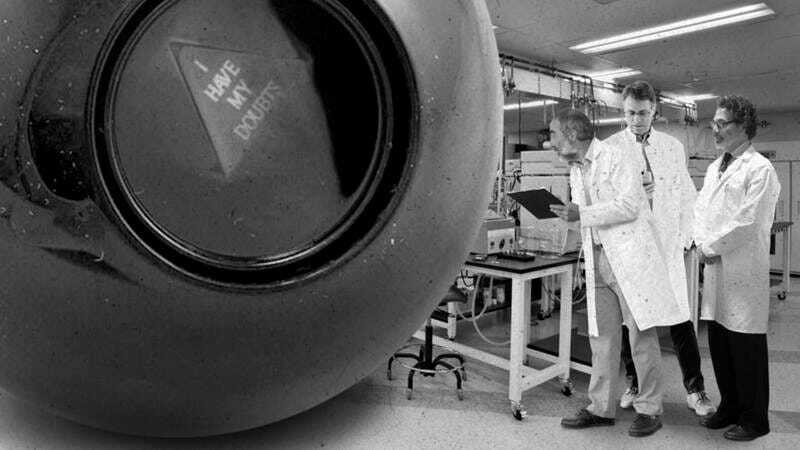 This photograph, taken at a lab at the California Institute of Technology, comes from back when only top research institutions could afford Magic 8 Balls and only five in the country even had them. With the 8 Ball weighing more than three tons, it took a team of six men and a system of hydraulics to shake it for an answer once a question had been asked. Not only that, but it could take an entire afternoon for the die to settle and reveal its answer, making any “Reply hazy. Try again” response a huge setback in terms of time and resources. And if the die got stuck showing an edge, it might be days before the team was able to shake it to become fully operational again. Because of these limitations, use of the 8 Ball was reserved almost exclusively to university, government, and military personnel. It would be another couple decades before improved fabrication technology made Magic 8 Balls small enough and cheap enough to produce that they became available to home hobbyists, though they still took up a whole lot of garage space and a good chunk of one’s savings. These days, Magic 8 Balls are lightweight, cheap, and easily transportable; you’d have a hard time convincing one of the technicians working in that photo that a modern one is as powerful as the one he worked on. In fact, the size difference between today’s Magic 8 Ball and the original model is roughly the difference between a golf ball and a Subaru. Pretty nuts! Yup, we’ve certainly come a long way. Really makes you think, doesn’t it?